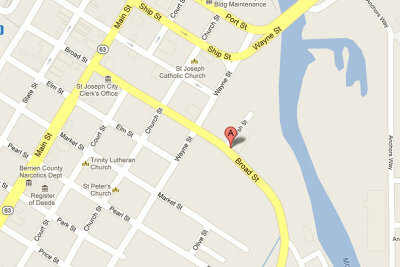 Our studio is located on the 3rd floor of the Box Factory in Saint Joseph Michigan. The Box Factory is a rustic old warehouse full of local artists, studios, and galleries. If you’re the adventurous type and would enjoy wandering through the galleries and studios before making your way up to find us on the 3rd floor the address of the Box Factory is below and any one of the friendly staff would gladly point you in the right direction. For the rest of you who (like me) want to know exactly where they’re going before they get there simply scroll down for more specific instructions on how to get here, where to park, and how to find us in the Box Factory as well! We will look forward to your visit! STUDIO HOURS: Tuesday | Wednesday | Thursday | Friday | SaturdayWhile we are at the studio on a regular basis many of our shoots take us out on location which makes it difficult to keep standard business hours. 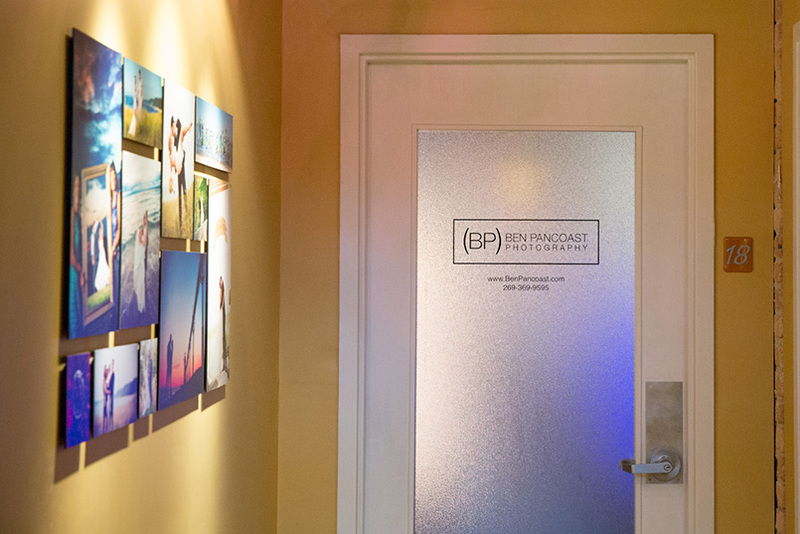 We’d love to have you stop in and say hi but would definitely recommend setting up an appointment if you’re coming from out of town and need to be sure to catch us! Generally speaking if the doors open just knock and come on in and look around, we’d love to say hi! 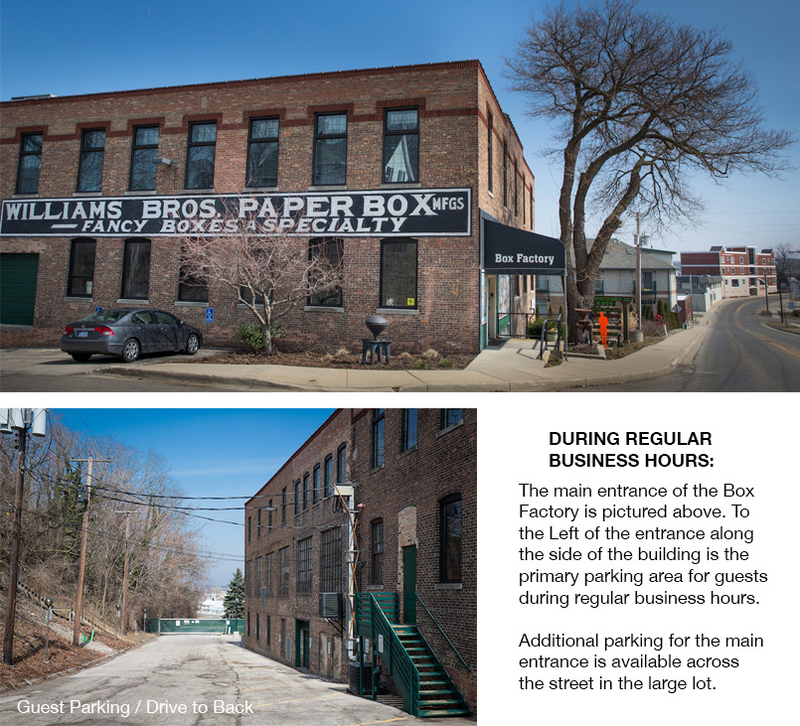 WHERE TO PARK AT THE BOX FACTORY:Generally speaking where you park depends on when you visit, for most people visiting during the Box Factories regular business hours you’ll use the main parking lot along the side of the building or across the street from the main entrance. For those of you who make an appointment to visit before or after regular business hours you’ll use the parking area behind the Box Factory and enter using the back door beneath the bridge. See photos for more details! Alright so you made it to the Box Factory and you’re ready to come find the studio, the building is BIG and like I said there are a LOT of other artists here so the key is really just to find the elevator. There’s only one and it’s towards the back of the building. This means its really easy to find from the back door but if you come in through the main door you’ll have to walk through the gallery towards the back to find it! It’s not hard to find, you just need to know you’re headed in the right direction!